Some pieces of music really should carry a government health warning. The first time I saw Wagner’s opera Tristan und Isolde live, the Liebestod scene was unforgettable. The intensity of the music mounted and mounted, receded and then mounted again and again until the all-enveloping release of the climax. It made my heart race and I was panting for breath by the end. I know that at least two conductors have died while conducting Tristan and I wonder whether any audience members have suffered such a fate due to overexcitement caused by the music. I wouldn’t be surprised. Another work that excites me to the point of danger, in a different way, is the film Koyaanisqatsi, with music by Philip Glass. The film came out in 1982 and I remember that it was screened at a cinema in London’s Charing Cross Road for many months. Whenever I walked past the cinema I saw this extraordinary word in big letters: K-O-Y-A-A-N-I-S-Q-A-T-S-I and wondered what on earth it meant. Then one day I watched the film and was mesmerized. Wikipedia describes it as a “visual tone poem”, which I think is about right. There is no dialogue, no characters, no action of a conventional kind. It shows the beauty and calmness of desert landscapes and the different beauty and frenzy of cityscapes, their people and machines. The subtitle is ‘Life out of balance‘, and there is a bit of an eco-political message behind it. I must confess I just enjoy the visuals and the music; they delight eye and ear and sweep me along. Koyaanisqatsi is something of a cult film. It was a shock in 1982 to realise that I liked something that was cool. I didn’t feel cool, I didn’t dress cool… I was a million miles from cool. I liked the film and its music not because it was cool, I just enjoyed it a lot. I have seen the film a few times in the cinema and listened to the CD of the music countless times; the music is embedded in my memory. The choir that I sing in (Crouch End Festival Chorus or CEFC for short) is performing an excerpt from Koyaanisqatsi in a concert on 5 Feb. It is a strange experience to sing music that that I have never sung before though I have known it so well for so long. The music uses a typically (for Glass) unconventional sound pallette including wordless voices. With no text the singing comes across as instrumental, but with vocal colour. I never thought of the piece before as choral music and it is not in the regular choral repertoire. We have received special permission from the composer to perform this excerpt in our concert. The Grid is a section of the film about 15 minutes long and features speeded-up time-lapse sequences of vehicles on the freeway, people walking along streets, workers in factories, commuters, data inputters, sausage machines, all with a tremendous sense of rushing. The dynamic visuals combine with the triple-charged excitement of the music. I recall a couple of times in the cinema finding myself tensed-up, clutching the arms of my cinema seat at the end of this section. The section ends very abruptly and you feel like you just stepped off a precipice . Philip Glass divides opinion. Some music-lovers do not like his music. The music is repetitive; it is not like ‘normal’ music with a melody and development; its beauty is emergent. Listening to it is a bit like watching a calm sea on a sunny day. Nothing happens but watching the sun glistening on the surface and the play of the rippling waves, always the same but ever-changing in their patterns, is beautiful. The Grid has the same scintillating quality. I am enjoying singing it, though it requires intense concentration and feverish counting. We have to sing like robots, matching the machine-like nature of the film. We in the choir have all been encouraged to watch the film. With no text to explain the “story” we need to understand the visual imagery to appreciate what we are singing about. 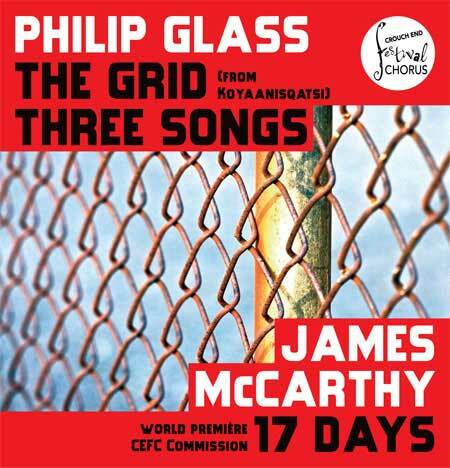 In the same concert we will also sing the Three Songs by Philip Glass, written a couple of years after The Grid. These are songs with words (by Octavio Paz, Leonard Cohen, and Raymond Levesque) , so they feel much more choral in character, but still have Glass’ trademark minimalism. My favourite of the three is the last song. It starts with humming, murmuring voices slowly moving through a harmonic progression. This continues to develop as the basses of the choir sing the melody. The words and melody move around the choir until finally a climax builds to the end. The title alludes to the length of time that the miners spent trapped underground with no contact from the outside world, before they were discovered. Just imagine. I know I get frustrated at work if our internet connection does down for a couple of hours. People were distraught at having a day without access to Wikipedia. Enduring 17 days with no communication at all from the outside world, not knowing whether you woud ever see the world outside again, let alone your loved ones. It is a terrifying and powerful story. When I first heard about the commission I feared that an attempt to recreate the tale in music was too risky, but I was wrong. We have been rehearsing the piece for several weeks and it is majestic, moving and masterful. Composer James McCarthy has the soul of a poet and he has responded to the theme in a poetic way. In his composer’s blog for the piece he says that poetic imagery often unlocks his musical imagination. His selection of texts ranges from Isaiah and the gospel of St John, to Rupert Brooke and Emily Dickinson, Charlotte Mew and Carole Lashof. His chosen texts reflect the feeling, the emotion of the story. For me the use of poetry gives great strength to the piece. McCarthy has a good ear for words and he takes great care over the sound of the words that we sing. Even with the best diction in the world an audience will not hear and understand every word that a choir sings, but they will hear the beauty of the sound of the words-and-music combined. Think of Mahler and the glorious word “Ewig” in his 8th symphony or “Auferstehen” in his 2nd symphony, or the marvellous words “Drop, drop slow tears” as set by William Walton in his anthem of that name. I have at times sung pieces (and some commissions!) by composers who were insensitive to the sounds of words. The results were not rewarding to sing nor engaging emotionally. One of the poems was specially commissioned by McCarthy from Carol Lashof, a sonnet called We live in mud. McCarthy says this is the black heart of the piece; it represents the voice of the miners underground. On his composers blog he writes that Lashof “has a very special ability to write not just great poetry, but also to write singable texts instinctively”. James McCarthy tells the story, then, through emotion rather than through narrative. And what a story it is. In a nutshell, it is a journey from darkness to light. A story of horrror, hope and glory. The music matches all these emotions. At times I find it difficult to sing as I’m shaken with emotion. He also uses a children’s choir that gives extra innocence and intensity to some sections (and always boosts the audience as their parents come to listen!). We have a great concert in store and I really hoe that many people will come to listen and experience this music. I feel that James McCarthy’s piece deserves to be widely heard. You will be affected by hearing it. The choir’s publicity and digital media teams have been in overdrive for this concert. You can watch a video of James talking to the choir’s conductor, David Temple, which includes excerpts from one of our rehearsals if you want to get a little taster of the sound of 17 Days. You can read James’ blog about the composition of the piece. He also writes about his choice of poems. The concert is in the Barbican on Sunday 5 February 2011. See you there! This entry was posted in Music and tagged Carol Lashof, CEFC, Chile, James McCarthy, Koyaanisqatsi, Philip Glass. Bookmark the permalink. I had no idea! Good luck with the performance, Frank. 17 Days does sound ambitious, and fascinating. As for glass, I admit to having been interested, and listening to some way back in my first-year undergraduate History of Music course (taught by a very interesting professor, who would likely make the subject of a good historical blogpost). But I confess that I have never made the effort to watch Koyaanisqatsi, although your testimonial makes me think that I should. Have you seen the other two in the trilogy? Richard- thanks for the good wishes. I didn’t you know you had a background in history of music. I’m a bit surprised that Glass would come up in such a course as he is rather present more than past. I have seen Powaqqatsi, and enjoy that music too. It doesn’t have the same manic quality of Koyaanisqatsi, but again is a beautiful combination of visuals and sounds. I have never seen Naqoyqatsi. Must try to look it out sometime. Frank – don’t be too impressed, it was an arts elective as part of the dreaded “breadth” requirement at the U. of Toronto (which reads, more or less, “thou shalt take a few subjects in areas other than what you’re really studying, it’s good for you, get over it already”, or words to that effect). I was an avid musician in high school (and a bit beyond) and as a result, really enjoyed that course. It was very heavy on medieval music, kind of skipped over the Baroque, and landed firmly in the 20th Century with Glass, John Cage, Karlheinz Stockhausen, and various other interesting composers. Best course I took in University, easily.